Different W, X, Y, and Z groups distinguish one addition polymer from another. 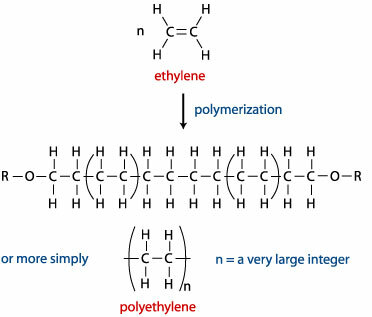 The image below shows one way that addition polymers can be made. This process has three stages: initiation, propagation, and termination. In the first stage, a substance is split into two identical parts, each with an unpaired electron. (Peroxides, which contain an O-O bond, are often used in this role.) A molecule with an unpaired electron is called a free radical. The free radical then initiates the reaction sequence by forming a bond to one of the carbon atoms in the double bond of the monomer. One electron for this new bond comes from the free radical, and the second electron for the new bond comes from one of the two bonds between the carbon atoms. The remaining electron from the broken bond shifts to the carbon atom on the far side of the molecule, away from the newly formed bond, forming a new free radical. Each half-headed arrow indicates the shift of one electron. 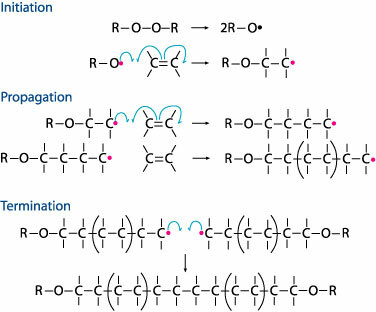 The chain begins to grow--“propagate,” stage two--when the new free radical formed in the initiation stage reacts with another monomer to add two more carbon atoms. This process repeats over and over again to form chains containing thousands to millions carbon atoms. It can be terminated--stage three--when any two free radicals combine, thus pairing their unpaired electrons and forming a covalent bond that links two chains together. If all of the atoms attached to the carbons of the monomer’s double bond are hydrogen atoms, the initial reactant is ethylene, and the polymer it forms is polyethylene. Polyethylene molecules made with the free radical initiation process tend to form branches that keep the molecules from fitting closely together. Techniques have been developed that use catalysts, such as Cr2O3, to make polyethylene molecules with very few branches. These straight-chain molecules fit together more efficiently, yielding a high-density polyethylene, HDPE, that is more opaque, harder, and stronger than the low-density polyethylene, LDPE, made with free radical initiation. HDPE is used for containers, such as milk bottles, and LDPE is used for filmier products, such as sandwich bags. 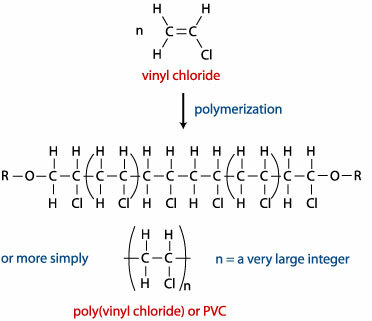 If one of the four atoms connected to the carbons in the monomer’s double bond is chlorine and the others are hydrogen, the monomer is vinyl chloride, and the polymer it forms is poly(vinyl chloride) or PVC.